ADAPT-ABI 2019 is a special-purpose program developed for the design and analysis of prestressed concrete bridges built either segmentally or conventionally. It provides information for geometry and stress control during construction, as well as design values for service load. 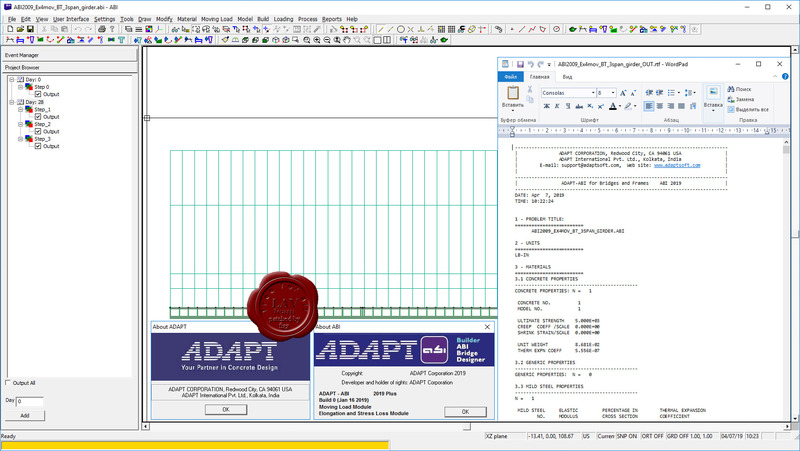 ADAPT-ABI has been serving bridge design engineers worldwide for over twenty years, and has provided the foundation for analysis of many notable bridges. Featuring a 3D modeling interface, and intuitive 4D construction sequencing capabilities, this next generation ADAPT-ABI delivers unparalleled modeling ease and speed. Packed with a full range of powerful modeling and analysis capabilities, ADAPT-ABI is a practical tool bridge engineers can use to rapidly evaluate design options and shorten project delivery times.